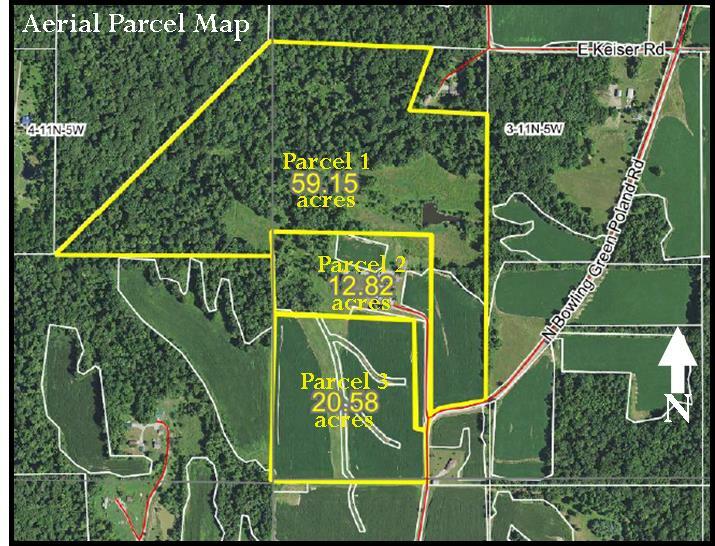 92.55 ACRES – TILLABLE – WOODS – PASTURE – FARMHOUSE – BUILDING SITES | Lawson & Co.
Monday, October 29th, 4:00 to 6:00 p.m.
Tuesday, November 6th, 4:00 to 6:00 p.m.
Parcel 1: 59.15± total acres; mostly woods with pond, pasture, & tillable; 355±’ frontage; building sites; great hunting/recreational tract. Parcel 2: 12.82± total acres; woods, pasture, & tillable; 92±’ frontage; 1900± year built farmhouse with over 2,000 square feet living area, vinyl siding, updated metal roof, living room, family room, kitchen, enclosed porch, 4 bedrooms, 1.5 baths, & unfinished basement; outbuildings include storage building, workshop, 2-car detached garage, farm barn with lean-tos, & several sheds. Parcel 3: 20.58± total acres; mostly tillable; 343±’ frontage; mostly Pike, Cincinnati, & Muren soils. highest total gross price at the auction. Directions to Property: Go south from Brazil on SR 59 to SR 42. Go east on SR 42 approx. 9.6 miles to Bowling Green Poland Road (850E). Go south approx. 2.1 miles to property at 2065 N Bowling Green Poland Road, Bowling Green, IN 47833. Directions to Auction Site: Go south from Brazil on SR 59 to Clay County Fairgrounds, 6656 IN-59, Brazil, IN 47834. TERMS: Successful buyer to pay 10% down auction day with balance due on or before December 13, 2018. TAXES: Taxes to be prorated to day of closing. FINAL BID: Property to sell subject to the final confirmation of the Clay County Circuit Court. SURVEY: In the event the farm sells in parcels, the seller will be responsible for the survey expense. INSPECTIONS: Call LAWSON & CO. at 317-745-6404, or visit the Open Houses.